Garage door services in Centerton that make homeownership uncomplicated! 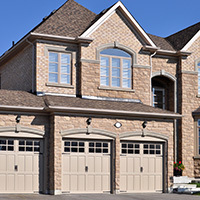 A & H Garage Doors Services is the premier garage door company in Centerton. As a homeowner, you likely have a long list of service professionals to help maintain your home and many times they can do a variety of jobs, however, garage door services are a bit unique in that, not any handyperson can tackle the job and produce high-quality and safe work. We focus on one thing at A & H, and that is providing premier garage door services in the Centerton community! Our workmanship goes above and beyond a handyperson, as we have the experience and knowledge-base to complete any garage door service. And, we can work within any budget, so whether you want a customized garage door with ornate features or a standard insulated garage door, we can provide our expertise. A & H Garage Door Services keep your garage door operating fluidly. Your garage door is important! To schedule a routine maintenance, repair, or replacement, connect with us today!